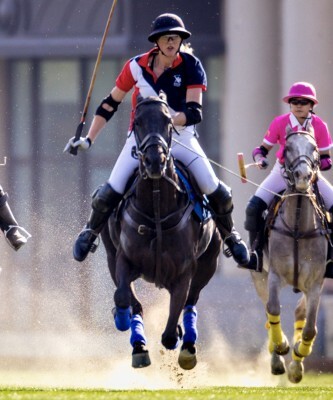 Rebecca Walters is a 28 year old professional ladies polo player from the UK. She travels around Europe, USA and Asia playing, coaching and introducing new women to the sport of polo. She first played polo at university in 2010 whilst studying her Equine Science degree at the Royal Agricultural University. Having come to the sport quite a bit later than most of her peers, she was able to call upon her previous riding skills as a show jumper to advance quickly in the sport. Before choosing to switch to playing polo as a profession in 2016, Rebecca was in marketing and international communications, working for a digital media agency in London. She only played polo recreationally on weekends and it wasn't until 2 years ago when she realised ladies polo was on the rise that she decided to play full time. Rebecca turned professional in the winter of 2016 with a 4 goal ladies handicap in the UK. Since then, her handicap has been raised year on year to where she now holds a 6 goal ladies handicap. She continues to self improve by training daily with her horses and by eating and living a healthy and balanced lifestyle. Her other passions include fitness, fashion and food, so keeping herself looking good and feeling great come naturally to her. @Stick&Ball - Stick & Ball is an authentic, luxurious, apparel and lifestyle brand inspired by the sport of polo in the countryside. @HookPolo - Incorporating fresh designs with advanced technical features, hook polo create gloves which offer a professional finish, with a creative twist. Priding themselves on British branding and talented British ambassadors, who are some of the UK's most competent players.